Instructions on how to use XpertHR online salary survey tools to define and then report on one or more job roles. From the Salary Surveys home page, click one of your subscribed surveys. This will take you to the home page for your selected survey, where you will be able to see all the different formats and applications you will need to benchmark a salary. The Price a new job button enables you to create your first salary table. When the pop-up window appears, you will land on the Search job tab. Type a job title into the Search by job title box. Once you've put in the job title, click the Search button at the bottom right of the window or press enter. Our system will then look for a match on job function and job level in our database, which is derived by applying powerful machine learning techniques to years' worth of data on manual job matching. If the job title you are looking for has a match in our database, your salary table will appear. It is possible that the job you want has several matches. So a more detailed job title will often get a better result. Enter "telesales manager" rather than "sales manager", for example. The data we show you at this point is based on the best available matched job level and function. However, you may choose to amend the job level or the job function that we have suggested or to select additional options relating to the role itself or the type of organisation by clicking Edit refinements (see: Refining a job role). You can also change the name of your table here. Sometimes, we are unable to suggest a suitable match based on your chosen job title. This may be because we genuinely do not have similar jobs in our database, the job is in a different survey or because you are using terms that are unique to your organisation. Where we are unable to suggest a suitable match, you will be asked to choose an XpertHR job level and function in the Select job tab. By clicking on the Select job tab, you can create the salary table you want to see by choosing an XpertHR job level and job function. Select the job level and job function (or function group - a grouping which includes a number of related functions) appropriate to the role. Then click the Add job button at the bottom right of the window. All job roles in an XpertHR salary survey are defined by their level of seniority and by their functional area. We provide standard definitions in the survey overview and guidance notes, to ensure that comparisons between organisations are made on a consistent basis. Once you have submitted your own organisation's data, you will probably have a good idea of what each of the job levels and functions relevant to your organisation means and how they relate to your roles. However, you can download a full guide from the survey home page at any time. When creating a new table in job pricing, start by selecting just one job level and one job function (or function group). You can always amend your choices later in the process. Once you have created a salary table based on a job level and function, you may want to refine it by selecting additional options relating to the role itself or to the type of organisation. This will enable you to match the job role more closely for benchmarking purposes. Click Edit refinements using the green button on the top of the table. By default you will be in the Job role tab showing you the job level and job function options you have already selected. You can change these if you wish. The Individual tab allows you to select options such as location or gender. There is, however, no requirement to select any of these refinements if you do not think they are relevant. The Organisation tab allows you to refine by options such as industry or organisation size. Again, there is no requirement to select any of these, and we would suggest you do so only if you believe that these options have a significant influence on salaries for this type of role. Once you have selected any relevant options, click the Refine button at the bottom right and you will be shown a fresh set of results based on your choices. When you create a report in job pricing, you will see a salary table and chart showing salary data for the job role drawn from our database. By default, we show you not just the median and average but the upper and lower quartiles and the upper and lower deciles. All tables also show sample sizes. These give you the number of organisations and individual employees whose criteria match those you have selected. In addition to basic salary, you will also see data on bonus and commission payments, car allowances and other benefits and payments. These vary from survey to survey to reflect the roles and industries covered. Commission, for example, is usually only shown in surveys covering sales roles. There may be occasions when you do not wish to see the full range of quartile or decile salary data - particularly when sharing the results with managers and employees. By selecting the relevant target measure from the dropdown menu at the top right of the table, you can choose to show just the median, average or other figure. The chart aims to give additional insight into the data by showing the spread of salaries for the role you have selected. Hover over any of the bars on the chart to see what proportion of employees fall into each salary range. Now that you have created a salary table and refined it to show the data you need, you can save it and return at a later date. The Save link is at the top right of the table. Click it and you will be shown a dialogue box which enables you to finalise the job's name and add notes if you wish to. By default, we also show you the job level, job function and other options you have selected for this role. You can add a new job at any time by scrolling to the bottom of the job pricing page and clicking on the Add job button or you can return to the survey home page and price a new job from there. Once you have saved one or more jobs, these will show on the survey home page. You will see the three most recently saved jobs listed individually using the names you selected for them. Older jobs can be found by clicking on See all saved jobs. If you click on any one of these saved jobs you will be taken to the results screen, showing the salary table and chart in the form at which you last saved it. Saved jobs may also be displayed via the second tab in the Add job dialog. Jobs can be removed from the job pricing page by clicking on the Remove link in green text at the top right hand side of the job. 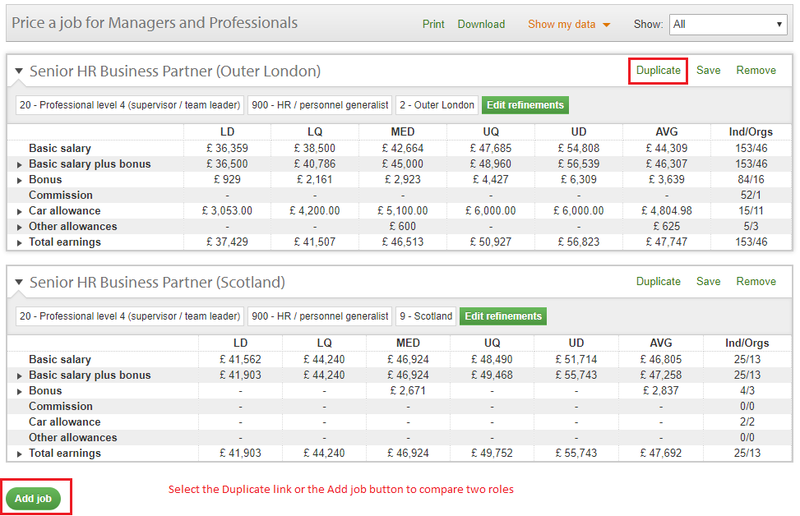 Jobs can be reordered within the job pricing page by clicking title and dragging the job to the desired location. The four-arrow mouse pointer indicates that the cursor is of a grab point that can be used to reorder the jobs. 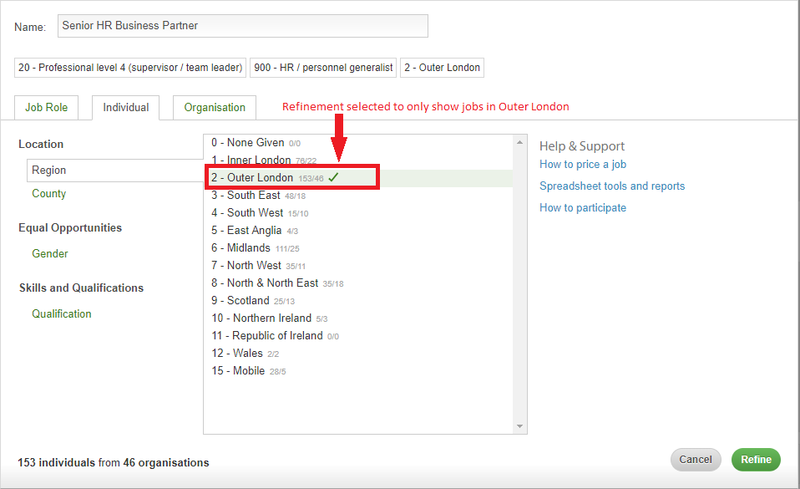 If your first job role was for Outer London, you may now want to Duplicate the first table, Edit refinements and change the name of the second role, select the Individual tab and then select Scotland from the regional options. First click on the Duplicate link (as highlighted in red below) and then click the Refine button and the table and chart for your second role will update. Alternatively, if the second role is considerably different to the first, you may want to select all refinements from scratch. In this case, click the Add job button at the bottom left of the table. Once your organisation has taken part in the survey and we have checked your data, it will be added to the database and to job pricing. All data is protected and anonymised, so no one from any other participating organisation will ever be able to see your data, and you will not be able to see theirs. Having priced a job, you will see orange text at the top of the salary table which reads Show my data. This has a dropdown menu, which enables you to select one or more of your organisation's installations. 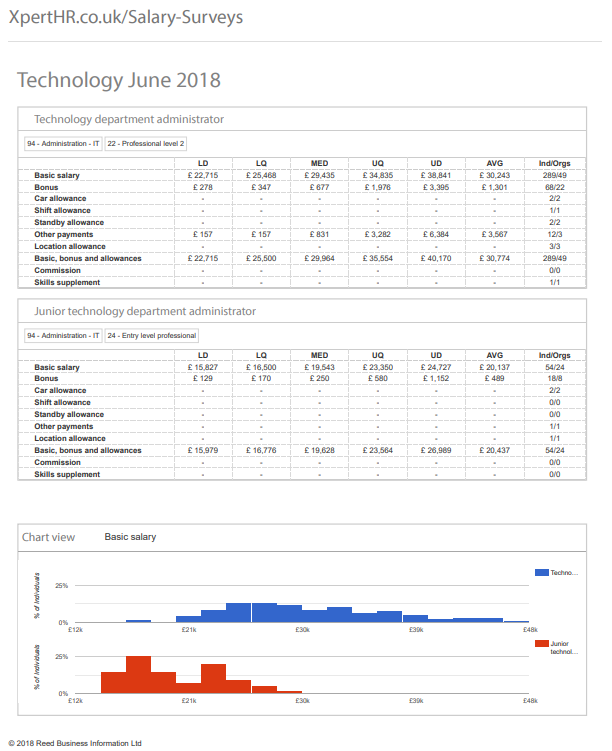 Once you have selected your installation, the table and chart will show additional columns for your organisation and comparisons between the selected market position (lower quartile in the example below) and your company's average payments for the job role. Job pricing also provides the ability to see more information about additional payments such as bonus and commission. Extra information is available whenever an arrow is displayed alongside the payment in the job pricing table. This is highlighted with the small red box in the example below. The extra information on addition payments tells you the proportion of individuals receiving the payment, the average amount of that payment, the average basic salary of those who receive the payment and finally the payment as a percentage of basic salary. In the above example we see that 55% of those in the job role received a bonus and that the average award was £3,639 or 8.47% of basic salary. Please note that the average basic salary in this section of job pricing will normally be different to that in the table above. It only covers employees who have received the additional payment. When you have created your salary table or tables, chosen whether or not to include your own data and selected the level of detail you want, you may want to download the results for use offline or in internal company reports. Click the Download link shown in green text at the top of the table, and all tables you have created in this report will download to your desktop in Excel format. The Excel report includes the job names you gave the roles when creating your job pricing report and lists all the refinements you made. To print a report use the Print link shown in green text at the top of the table. Clicking on the Print link will enable you to print off a specially designed version of the job pricing report. This printer-friendly version of the report includes job tables and charts.